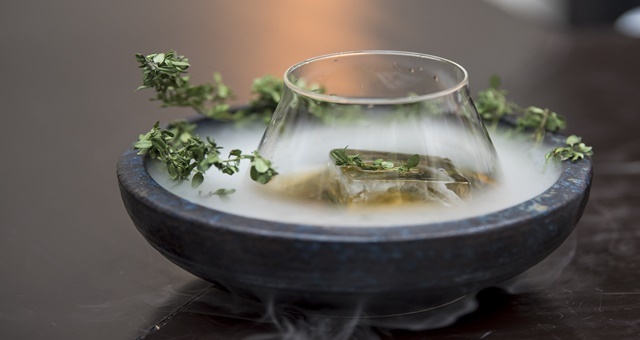 Thyme Out – winner of the Time Out Cocktail Competition for 2018. Five of Sydney’s best ‘mixologists’ wowed the crowd as they mixed and blended their signature creation in the second Time Out Hotel Bars Cocktail Competition this week. The competition required each entrant to put together their own creation based on their choice of three classic cocktails – an Old Fashioned, a Mojito or an Espresso Martini. After carefully assessing each entry, judges declared Sokyo Lounge’s cocktail gun Behzad Nvaziri the winner for ‘Thyme Out’, a herb-infused twist on an Old Fashioned. Nvaziri took the conventional recipe of whiskey on ice cubes muddled with sugar, bitters and citrus rind, instead using bacon fat-washed Irish whiskey, chardonnay vinegar, honey and thyme lemon syrup to deliver his perfectly executed concoction. Competing for the prestigious accolade were expert shakers from popular Sydney venues including Zeta Bar (Hilton Hotel), Hacienda (Pullman), Zephyr Sky Bar (Hyatt Regency) and Alibi (Ovolo Hotel). Drinks were assessed on appearance, taste, creativity, their explanations and also for accessibility as a key judging criteria was that each drink shouldn’t be so complicated that it cannot be made behind a bar on a busy night. Time Out CEO Michael Rodrigues praised the finalists’ creativity, saying the competition was a great way for each bar to stamp their creative mark on Sydney’s bar scene. And if you’re keen to try the finalists yourself, each competing cocktail including the winner will be available at the five finalist bars until 31 July.